Bills former fifth-round pick Ed Wang was released by the club on Tuesday. Wang has been on the team’s reserve-injured list since the season began. The offensive lineman battled injuries throughout his brief career, missing the first half of his rookie season following thumb surgery. Now released Wang is free to sign with any NFL club. Big one at the Ralph on Sunday with the Eagles flying in. The only certainty is it’s going to be a very entertaining game. Now to your questions, which can always be submitted to AskChris@bills.nfl.net. My question is: Why isn’t David Nelson ever mentioned as a potential perimeter x or z receiver in the Bills’ system? With his 6’5″ 215 lb frame, I was surprised he was not more of a consideration after Marcus Easley went down, especially after the past few weeks’ performances and perhaps even prior to that. He is a big target with soft hands and good route running ability. Does he lack the speed necessary to get down the field? I believe he ran a high 4.4 to mid 4.5 40 time at the combine, isnt that considered somewhat average? On a side note, I think Kamar Aiken has a bright future ahead of him given the opportunity. I was worried he wouldn’t be signed to the practice squad, great signing. CB: Nelson’s best spot is in the slot. He’s a great mismatch inside because of his size. Outside you need a receiver that is faster and more physical, and Donald Jones has a skill set better suited for that. Nelson is a smooth route runner and knows how to find the holes underneath. He seems to benefit from having ‘two-way go’s’ as a slot receiver, which means he can break his route off inside or outside on the defender. Outside receivers don’t have that option lined up close to the sideline. I do agree with your thoughts about Aiken. I think there is certainly potential there and he would be an outside receiver option down the line. I was wondering about Troup and his timetable. I know he has been limited in practice and that is good progress, but I wondering if there was an update. Thanks again for all you do and has anyone ever told you that you ask really long questions? Just an observation not a critique. CB: Troup’s lower back situation is something he’s dealt with in the past unfortunately. He worked on his core strength relentlessly all offseason in an effort to lessen any strain on his back, but the stiffness resurfaced at the beginning of the year and is now back again. I don’t know if there’s a solution to eradicating it, but Troup is doing everything he can to make it a non-issue as far as playing on Sundays. I don’t know if it’s going to be a chronic condition that plagues him the rest of his career, but it is concerning. And yes, I am long winded. I try to cut questions shorter, but it never seems to happen. Not sure why I choose to give a preamble. I was just wondering if you can explain the captains’ C and the significance of the stars underneath – some are solid, some are not. Also, where has the pass rush been? It doesn’t seem like they are getting much pressure on the QBs they faced so far this year. Can Dareus and Williams be that Suh-type player for us up the middle? Can we get there with the blitz; we haven’t been doing it much this far? CB: The stars under the captain’s C represent how many years a player has been a team captain. Each year they are a captain is represented by the number of stars that are gold underneath the ‘C’. There are only four stars under the ‘C’ so if a player has been a captain for more than four years, like Brian Moorman, the ‘C’ is turned gold as well. As for the pass rush, the Bills had a bit more success against the Bengals, but getting home with four hasn’t proven very fruitful. Part of the reason was the first two weeks against last year’s top two rushing offenses, the focus was the run game. Against Brady and the Patriots they chose to drop 7 into coverage and get hands in the passing lanes knowing getting to Brady rarely happens. But you’re right it has to be more productive moving forward. Could you tell me what’s wrong with Easley? I was really hoping to see him play this year. Also how is Merriman’s shoulder? CB: I actually saw Easley in the locker room on Thursday this week as he was in to pick up a few things. He spoke at length with Bryan Scott, and afterwards I asked him if he would mind talking about his condition, which forced him to go on injured reserve. He said he’d prefer to keep his situation private, so I chose to respect that because it’s certainly his right. Whether he changes his mind down the road remains to be seen, but we’ll try to revisit it if Easley’s view on his situation changes. What happened to Bruce Hall, Jon Corto, Felton Huggins, and Ed Wang? The last time we saw Bruce Hall, he was carrying the ball over the goal line. Then he was placed on IR. Were these really season-ending injuries, and if not, why not just release them? Does anyone know what happened to these guys? What also happened to Robert Eddins, for example? Was it really a season ending injury or something that would likely nag him for a few weeks? CB: Corto, Hall, Huggins and Wang were all waived-injured when the final 53-man roster was assembled. They had injuries, but were not going to be on the 53-man roster so they were waived. Once they cleared waivers the reverted to Buffalo’s injured reserve list where they currently reside now. Robert Eddins was in a similar situation, but if memory serves asked for a release from injured reserve, which was granted thereby making him a free agent. Players with injuries that won’t last the season often do this to have an opportunity to latch on with another NFL club once healthy. Bills OT Ed Wang did not practice Thursday and is not expected to dress for Saturday’s preseason home opener against the Jaguars. Wang had been running with the second unit at left tackle. He was replaced in practice by Cordaro Howard, who is also expected to replace him in Saturday night’s game. DL Marcell Dareus is not on the practice field here on Thursday. Dareus left practice early after getting leg whipped on Wednesday. Ed Wang is also a new non-participant at practice. Here are the other non-practice players. Bills head coach Chan Gailey and his staff have to find out more about certain players on their roster. Two in particular will be given extended time on the field tonight against the Bears as a result. Left tackle Ed Wang, who has been working with the second unit, will get some extended playing time against Chicago after not playing all that much as a rookie. Another player that will get extended time is LB Aaron Maybin. Maybin has been running with the second defense. Gailey said Maybin has done well in practice this past week and said he sees a sense of urgency in his play. He’ll get a good long look tonight against the Bears. Bills GM Buddy Nix touted Shawne Merriman as having natural leadership in addition to great ability as a football player. I noticed the first instance of that leadership Monday. The Bills offensive line had just finished a particularly tough practice in which they surrendered five sacks during team period. Ed Wang was starting at left tackle with Demetrius Bell out injured. Wang was going against Merriman for a good portion of the 11-on-11 work and did surrender a sack and a couple of other pressures through the course of practice. When practice was over however, Merriman approached Wang and took the time to go over pass rush tells by ends and linebackers in an effort to help Wang better anticipate what’s coming. Merriman even demonstrated a couple to Wang in slow motion. It was only a two minute exchange, but it’s clear that Merriman realizes leaders make more than themselves better, they make the team better wherever they can. With Demetrius Bell currently out with a shoulder strain, it’s forced some very inexperienced offensive tackles into some important roles at left tackle, namely Ed Wang (starting in Bell’s place) and Cordaro Howard (getting 2nd team reps). For head coach Chan Gailey it only emphasizes the urgency to get the younger players up to speed should there be an injury during the season. When asked if offensive line is a worry every year and a work in progress, Gailey answered in the affirmative. With LT Demetrius Bell’s practice day over Ed Wang is starting at left tackle. Cordaro Howard is playing left tackle with the second team. Big uniform unveiling tonight. Should be a lot of fun. For now let’s answer your questions to pass the time before the big show. Remember you can submit your questions at AskChris@bills.nfl.net. I know I asked you about the Bills trading for Tebow, but with all the talk about Pryor, do you think that the Bills will do something with him? I think if we get either one of them they can sit behind Fitz and learn. Chan likes mobile QBs so this could be a good opportunity to get one and let him learn. What do you think? CB: First as I’ve stated in the past I don’t think Tebow is the one on the trading block in Denver. All indications are it will be Kyle Orton if anyone is moved. With respect to Pryor the only reason he’s getting so much attention is because of the Ohio State NCAA investigation and his subsequent separation from the program. Most experts believe his game is still lacking in several areas. That’s not to say he’s not capable of playing in the NFL, but most have said an NFL club would spend a 5th to 6th round pick on him in the Supplemental draft at the most. My belief is that teams looking at their quarterback position will compare Pryor to the class of quarterbacks due out next spring in the 2012 draft and determine whether he’s someone worth investing in now or if they’re better off waiting for what’s available in the draft pool next year. Can you break down the strength and weakness of the Bills O-Line? Are they a better run blocking or pass protecting team? I think the unit was underrated in passing and Ryan didn’t appear to be sacked as much as previous QB’s. In some games the injured O-line was often stuffed at the line. Bell and Wood both had a somewhat healthy season too. Will Wang and Hairston push and compete for a starting job as well. CB: I think individually some of them are stronger in run blocking than pass blocking and vice versa, but the unit as a whole is still working on their identity in terms of what they do best. Part of the problem, as you pointed out, was the unit was beset with injuries and began the season with two tackles that could play despite not being 100 percent healthy. The run game got better as the season wore on, and most of the linemen would agree that while they did improve their pass protection they’d be the first to credit Fitz for getting the ball out quickly and making them look good at times. Hairston and Wang will compete with the incumbent starters, but I think in the end Erik Pears and Demetrius Bell will start at tackle in 2011.
news from 1 Bills Drive. Thank you very much and keep up the good work! Now to my deep concerns . Throughout all of the labor talks there have been a few owners and managers whose names have always come up in the negotiations process. The likes of Jerry Jones, Robert Kraft, Scott Pioli, and Bruce Allen come to mind first. Now I know at times a representative from every club had to be present for meetings, but it just seems that the bigger market reps are the ones we always hear about. Is this because they are the only ones really doing the negotiating for the owners or is there more to it that I am not understanding? the increase in player wages. Can you please shed some light on these subjects? It would be greatly appreciated. Thank you again. CB: The reason owners like Jerry Jones and Robert Kraft are often in the press is because they’re high profile owners with nationally recognized franchises. Both men are also part of the 10-person Labor Committee for the owners, chiefly responsible for helping to bridge an accord with the players. In fact here is the entire list of Labor Committee members for the owners. As you can see the labor committee representation is split down the middle between the large and small market clubs. Cincinnati, Green Bay, Kansas City, Pittsburgh and San Diego are considered the small market reps. Obviously small market ownership feels comfortable with this balanced representation. Your concerns are not uncommon. I remember when I hosted the conference call with Bills season ticketholders and NFL Commissioner Roger Goodell, the biggest concern was revenue sharing and it’s a valid concern. Here was the commissioner’s reponse to those concerns. I can tell you with the NFL one of the things I’m proudest of is we continue to find ways to share new revenue. Our system right now close to 80 percent of our revenue is shared amongst the clubs. That’s one of the core reasons that the system works and why the Buffalo Bills have the financial ability to compete. You always have to evaluate that system and balance that system to make sure as the economics of the league changes, as revenue growth changes that you continue to have a system that will allow that revenue to grow, but also share it in a way that will allow the fundamentals of the league continue to be successful. I know our ownership has always stepped up to that and we will continue to do that to make sure that everyone has the financial ability and we can make sure that the Buffalo Bills and every other small market come into the season with the ability to be competitive. The commissioner also went on to point out that the biggest revenue source for NFL clubs is the television revenue and that is shared equally amongst the clubs. I realize that the most recent talk about mandating teams to spend very close to the cap every year (no salary floor, no salary ceiling) in some reports could be discouraging, but I think a lot of that still has to be sifted out. That’s where having proper representation on behalf of the small market clubs on the owners’ labor committee is essential. Just want to thank you for always being on top of things with the Bills and for keeping us Bills fans informed. I have 2 questions I hope you can answer. I like what the Bills did in the draft this year. I still see some gaping holes though and wonder what your thoughts are on addressing them: I see us needing a QB (either a backup for this year or franchise QB going forward), a cornerstone OT (I don’t see one on our roster just a few passable OT’s for now), a TE, and an OLB ( I am hopeful Merriman comes back healthy and I like Moats potential…. but that is still just potential). Do you feel any of these will be filled this year in FA and do you see other needs that I didn’t mention that we need to have addressed ASAP? CB: I think even the Bills themselves admitted that they wanted to either land a future franchise QB or a veteran to be a backup to Fitz. Based on how things played out in the draft it’s safe to assume they’ll be trolling for a backup whenever there is a free agency period. At tackle I think there’s a bit more there than meets the eye. Defense was the pressing need in the draft and as a result it took precedent over some of the positions that you listed. It’s hard to predict how aggressive the Bills will be in free agency because the new rules in a new CBA could alter strategies with respect to things like “dead money” on a cap and absolute dollars where it’s on your books right now and not pushed into the future. So we have to see what the rules will be before we can judge how a team like the Bills will approach free agency. Can you explain the eligibility rules for the practice squad? Is there a number of games a player can dress and be on the active roster then to be switched to the squad? How many players are allowed on the squad? Could players like Howard, Roosevelt, Donald Jones, Ed Wang land on the squad since they maybe behind the pecking order at OG and WR? CB: Players can typically spend two seasons on a practice squad. There are stipulations that allow for a third year, but I’m not going to get into those here. Once a player has dressed for nine NFL games he is no longer eligible for the practice squad. So for example, when Jim Leonhard in his first season with the Bills appeared in nine games, he was no longer eligible for the practice squad. Practice squad sizes can hold a maximum of eight players. Howard appeared in 10 games as a rookie last year and Jones in 15. Both would no longer be eligible for the practice squad to my knowledge. Wang and Roosevelt who each appeared in six games are still practice squad eligible. The current tackles on Buffalo’s roster are Demetrius Bell, Mansfield Wrotto, Erik Pears, and Ed Wang. Hey Bills fans. I’m taking the day off for my birthday, but here are some answers to your questions from AskChris@bills.nfl.net. Have a good weekend. Can you break down how Bowers, Fairley, or Dareus would fit in the Bills 3-4. Can you explain the difference between a five technique and three technique lineman. Would they have to only play the DE position with Kyle up the middle. What are the future plans in the 3-4 for Troup and Carrington going forward in terms of starting next season. CB: Bowers and Fairley would be strictly defensive ends in the 3-4. Some believe Bowers can shift to an OLB role in a 3-4, but I think he’s strong enough at 275 pounds to stand in there at end in a 3-4. Fairley could be a three technique defensive tackle in a 4-3, and knowing Buffalo is going to be multiple with their fronts on defense next year, he has double value. Dareus is the prospect with the trump card though. He is a fit in either defense because at 319 pounds he could stand in there and play nose tackle in a 3-4, but he’s athletic enough to play end in a 3-4, which is what he did at Alabama. He could also play the one technique or three technique defensive tackle in a 4-3. The only difference between a three-technique and five-technique is the alignment of the defensive linemen. Now their roles are different in the scheme of the defense, but basically there are numbers assigned to the alignment of a defensive lineman. For example, if they are lined head up on a center they’re in a zero technique. A one-technique defensive tackle is lined up on the shoulder of the center. This DT is typically the grinder that ties up blocker in a 4-3 front. A three technique DT is lined up on the outside shoulder of the guard and is usually the more athletic penetrating type defensive tackle. A five-technique is an alignment usually for a DE in a 3-4 on the outside shoulder of the offensive tackle. Their role is to stand and grind with the OT and sometimes TE to hold the point of attack and allow linebackers to run free to make tackles, although they have full license to disengage and make plays themselves. The alignments go all the way up to nine, which is the widest alignment, usually taken by a pass rushing DE or OLB. I’ve taken some heat for this question already. But I’d like your take on it. What are you thoughts on building up the defense and o-line this year and trying to pick Andrew Luck in next years draft? Now I know he will probably be the #1 pick in the draft but if we package some picks together or some players and picks, we may be able to get him unless we have a horrible season and end up picking #1 overall. I just think that no one besides ryan mallett would be worth grooming or putting any time into as far as a qb for the future. Luck has everything your pretty much want in a qb coming out of college and i’d like the bills to have a player at QB who isn’t so much of a question mark. Besides Fitz is playing at a high level and we need to invest this season in other areas such as defense and o-line. As always thank you for your time. CB : I don’t think your idea is so far-fetched. I’m all for loading up on the defensive side of the ball and if you still have time to address offensive tackle all the better. I don’t mind being aggressive and doing whatever it takes to get up to number one next year for Luck. Just keep in mind it’s anything but a guarantee, knowing first there’s likely to be a host of other NFL clubs looking to make a similar trade deal for Luck, and you’re likely to have a team in that number one spot all too happy to take Luck first off the board, and with no interest in trading out. It’s not something you can bank on. That’s why I think there’s a good chance they take a QB somewhere in the draft. I’ve been reading a lot about the right tackle position and the teams general need for linebackers. In those conversations, I never see anything about Ed Wang or Arthur Moats. Is Wang still that far away from contributing as a right tackle (even as a backup)? Was his injury the big setback or does he just have a lot more to learn? I was thinking Moats, Poz, and Merriman would be 3 of the 4 starting linebackers next year – the 4th being a new addition with a big, run-stuffing frame. Do the Bills see Moats more of a 3rd down rush linebacker? Do they see issues with his run defense? CB: I think in the end Wang will be best suited to play guard. That’s just my opinion. Right now guard is a deep position. They worked him at both guard and tackle last year and I anticipate that will continue. I don’t see him getting on the field as a starter in 2011 however. Buddy Nix has said he likes some of the young talent they have at OLB, and that includes Moats. He’s got potential, but if Merriman is healthy and the Bills draft a pass rushing LB high (e.g. Von Miller), Moats will not be a starter. Personally I expect them to address ILB with more picks than OLB, not higher picks, but I wouldn’t be surprised to see two picks used on ILBs. Kiper brings up an interesting observation with his 2.0 mock draft. Newton to Bills. Does the possibility of his tremendous upside make him too attractive for the Bills not to pass up? Even if the Bills take someone like Von Miller that doesn’t mean he pans out either. (i.e. Maybin) Newton could be worth the gamble. CB: It’s the 64 million dollar question Jim. Picking this high doesn’t happen often and it affords you the opportunity to get a franchise quarterback if you believe there is one in the draft. That’s what the Bills have to figure out. Is there a franchise type QB in the draft. If so they have to take him, whoever it is (Newton, Gabbert). If not, then they have to take a player that is considered a sure fire star. The safest picks at the top of the board are Marcell Dareus and Patrick Peterson. Doesnt the Bills releasing Marcus Stroud indicate that they will go for a defensive end with the no. 3 pick in the upcoming NFL draft? Perhaps Marcell Dareus, if Bowers and Fairley are gone by the time Buffalo picks? Or will it be LB Von Miller, who I believe Gailey likes? CB: I think it increases the positional need. With the three top flight talents you mentioned I think they feel good about having the chance to take one of them. Whether they feel all three are worthy of the third pick is another question. Von Miller is an option as well, and yes Gailey may like Von Miller, but there are very few head coaches in the NFL, if any, that don’t like him. President Obama is in the midst of hosting Chinese Hu Jintao as part of an international relations summit. The White House hosted a state luncheon and a lavish state dinner last night. Bills offensive lineman Ed Wang was among the invitees to Wednesday’s lucheon. The first NFL player of full Chinese descent, Wang was obviously seen as a person of interest to have at the luncheon by the decision makers at 1600 Pennsylvania Ave. with respect to the invite list. Ed tweeted about his visit in which he got to meet President Hu Jintao. 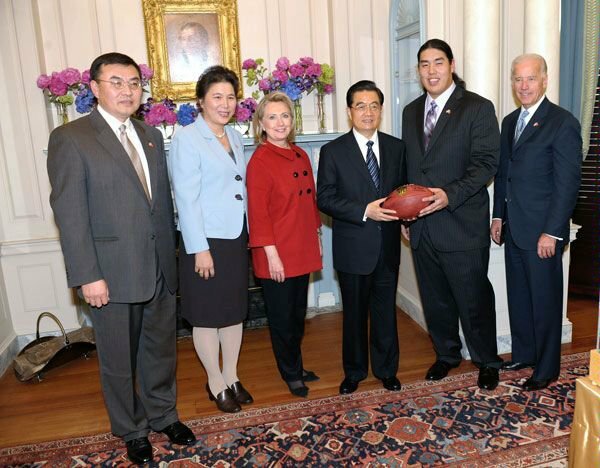 Here is a photo from his Facebook page where he appears with (from left to right) his parents Robert and Nancy Wang, Secretary of State Hillary Clinton, President Ju Hintao and Vice President Joe Biden. Bills OL Chad Rinehart made his fifth career NFL start and first in two seasons Sunday and fared particularly well. So well in fact that he won’t be rotating in for Cordaro Howard. Instead he’ll be starting at right guard against the Dolphins. With Howard essentially playing hurt the rest of the season with a shoulder problem that prevents him from maintaining his full strength through the course of a game, Rinehart rotated in for certain series in the game. But with Howard hurting Rinehart may play the full 60 minutes Sunday in Miami. Ed Wang is an alternative as a rotational guard if Howard is unable to go Sunday. Earlier in the week Bills head coach Chan Gailey indicated that the right guard spot would be manned this week by Cordaro Howard and Ed Wang against the Browns today. That plan sounds as if it has been changed after the conclusion of the practice week. On Wednesday Gailey said that Howard and Wang would “probably” split the right guard duties on Sunday, but it’s pretty clear that it will now be a combination of Rinehart and Howard. Rinehart, who was promoted to the active roster earlier in the week, has four NFL starts in his career all of which came with Washington in 2009 at guard, so he has a bit more experience than Wang. It sounds as if he’ll spell Howard, who is still not fully recovered from a shoulder injury that he sustained last month, throughout the course of the game. Last week when Kraig Urbik had to move to center to replace Hangartner, rookie Cordaro Howard stepped in at right guard. But he won’t be the only lineman manning that spot through the course of Sunday’s game against the Browns. Head coach Chan Gailey said there will be a platoon type situation at right guard this week. Howard has been playing through a shoulder injury. Wang saw his first NFL action on offense last week when he stepped in at left guard against the Vikings after Andy Levitre had to play center following the losses of Geoff Hangartner and Kraig Urbik to injury last Sunday. Chad Rinehart, who was elevated to the active roster, to fill the hole left by the I-R’d Kraig Urbik is expected to play primarily a guard role, with reserve center also a possibility. Rinehart, who played mainly tackle in college at Northern Iowa, has transitioned inside. He has been doing some center work on the side of late in the practice setting and could possibly serve as a reserve center this week, though most of his reps have been at guard. Head coach Chan Gailey has yet to determine who would start at right guard, presuming that Eric Wood starts at center while Geoff Hangartner is out (knee). Cordaro Howard played there last week when Urbik moved inside to center to replace Hangartner. And then Ed Wang stepped in at left guard when Andy Levitre had to move to center to replace Urbik. Bills offense exploded last week. Gotta hope for more of the same against a Chiefs weak pass defense. Could be another shootout this week. Keep your questions coming at AskChris@bills.nfl.net. Now to your questions for this week. I was writing in regards to the comments made by Ralph Wilson about persuing a QB next year. Do you think that was a shot at Fitz? I think Fitz is doing an excellent job of hanging in there and making some plays when everyone else is falling apart. I think the number one priority definitely needs to be defense. This is the second straight year they can’t even come close to stopping the run. I mean Fitz has been putting up points and enough to win if your defense is anywhere near respectable. What do you think we need to focus on in terms of personel for next year? I know Fitz probably won’t be the guy for the next ten years but I see much bigger holes to fill that even Tom Brady couldn’t win with. CB: There’s no question that the defense has more holes to fill than the offense, but I believe that two of the top three most important positions on a football team are quarterback and left tackle along with a top flight pass rusher. All three remain holes for this team to fill. Yes, Fitz has been on a tear and he’s remarkably effective in organizing the protections while also surveying the coverage pre-snap. After the Baltimore game some are tabbing him the future QB. I say let’s let the last 10 games play out before anyone passes judgment as to what the plan should be at QB. The bottom line though is I remain convinced that QB, pass rushing OLB and LT all need to be addressed in this draft first and foremost. 2 – How’s Ed Wang doing? You hardly ever hear about him, is he working with the team? He sounds big enough to keep some of those people off our QB.In Fla we hear nothing about the Bills. So I go to Buffalo on the computer. I haven’t heard anything about Ed. Hope he is helping out??? CB: Ed Wang has been practicing with the team since the start of the regular season coming off of thumb surgery after suffering the injury early in camp. He missed the entire preseason and had to practice with a giant club on his hand. In the last two weeks he’s shed the club and is practicing normally with the thumb. All that being said, Wang had been working for about a month at guard and this week was transitioned back to tackle. Head coach Chan Gailey has told me they’re cross training him to see where he might fit best. However, I don’t expect to see him on the field on Sundays this season. He’s got an awful lot to learn and missed an inordinate amount of time (the whole preseason) due to thumb surgery. This will be a learning year for him and little more unless there’s a rash of injuries on the offensive line. I cannot understand how Reggie Corner’s interception at the end of the first half against the Ravens wasn’t awarded to the Bills. Did the NFL ever issue a statement explaining the call? I understand that only one of Corner’s feet touched the ground and the other one landed on Boldin’s shin, then he basically landed in Boldin’s lap and rolled out of bounds. But if Boldin is in the field of play, shouldn’t his body also be considered part of the field of play? If the rule states that a defender’s body isn’t part of the field of play, then, hypothetically, when a receiver jumps to make a catch, a defender could catch the defender while he’s in the air and carry him out of bounds. Couldn’t he? Is there anything in the rule book that would prevent this from occurring? Any clarification you could give would be greatly appreciated. CB: You hypothetical situation is correct. The force out rule, which was amended prior to the 2009 season allows a defender to carry a player out of bounds preventing the receiver from getting two feet down in bounds and is an incomplete pass. carried out of bounds, player possession will be granted (8-1-3 item 6). In referencing Rule 8, Section 1, Article 3 – item 6 as stated in parentheses it states the following. In reading the first note one might think that Corner was deserving of an interception since he was rolled out of bounds by Anquan Boldin before he could get both feet down. However, in reading Item 6: Carried out of Bounds, it seems that Corner would have to be held up and carried out of bounds to be awarded the interception. Corner was rolled out of bounds as part of a regular football tackle. So unfortunately it becomes a matter of interpretation by the official. Nowhere in these two sections is anything mentioned about a tackler being an extension of the field. That issue only seems to come up when there is a loose ball. In talking to Chan Gailey about this play he told me he did not have an issue with not being awarded an interception. He said he argued with the official about offensive pass interference. Gailey said Boldin was grabbing Corner’s right arm before the ball arrived, forcing Corner to catch it with one hand, which he did. Hope this helps. I read your article Chiefs Plan Encouraging for Bills Future and it strengthened my opinion that the Bills just haven’t been bad enough the past decade to really get better. They have had a slew of seasons where they won 6-8 games, never quite giving them that big-time draft pick. The Chiefs seem to be ahead of our Bills on getting their team turned around, mainly because they were worse sooner (and they seem to have done a better job adding talent).Picking in the top ten of the draft for 4 years helps. What are your thoughts that if the Bills hit bottom sooner, they may be better today? CB: I do believe at this day and age of the NFL it’s easier to get better if you simply bottom out. The Chiefs, as I mentioned in my story on Buffalobills.com, are an example of this as are the St. Louis Rams. After going 1-15 and 2-14 the past two seasons they’re on the way back up with premier young talent. If the Bills in fact bottom out this season it makes climbing back up the mountain easier in my opinion because the players you’ll have in your arsenal will be the best in their class. CB: Well we’ve got to start with the 2000 NFL draft and I’m not going to list pick by pick each year. Here are the Bills first-round draft choices and what became of them. 2000 – Erik Flowers – washed out after just two seasons and played a few seasons as a reserve for the St. Louis Rams. 2001 – Nate Clements – was the team’s leader in interceptions each of his five seasons in a Bills uniform, but signed a gigantic free agent deal with San Francisco that Clements has been unable to live up to. 2002 – Mike Williams – Bills held onto him for four seasons. He had ability, but just did not have the passion to play football. Made a brief comeback with the Washington Redskins last season. 2003 – Willis McGahee – Could not play his rookie year due to his catastrophic knee injury in the National Championship game in college, but ran for 1,100 yards in his first NFL season. Grew disenchanted with Buffalo as a city and was traded to Baltimore for a pair of third-round picks and a seventh-round pick. 2004 – Lee Evans, J.P. Losman – Evans has been the team’s number one receiver for the past five years. Losman was appointed the starter in 2005, but never nailed down the job for good and was eventually allowed to depart as a free agent after the 2008 season. 2005 – No first-round pick – as part of the trade up to get Losman in 2004. Roscoe Parrish was the team’s first pick in round 2. 2006 – Donte Whitner, John McCargo – Whitner has been a starter at strong safety for almost his entire career with Buffalo. McCargo has one career start with the Bills. 2007 – Marshawn Lynch – Had back-to-back 1,000-yard rushing seasons, made the Pro Bowl, but was traded after three seasons to Seattle. 2008 – Leodis McKelvin – One of the team’s top three cornerbacks. Currently starting in place of an injured Terrence McGee. 2009 – Aaron Maybin – Struggling to get on the field right now. Does not have an NFL start on his resume to this point. 2010 – C.J. Spiller – Has a 95-yard kick return for a touchdown and is playing a complementary role on offense to Fred Jackson in the offensive backfield. BONUS – Do you think Fitz has a chance to solidify the role of the long term number two, similar to what Frank Reich was in the glory days, with a chance to start for a year or two while the long term QB we hopefully draft next year develops in the practice setting and adjusts to the NFL? I think this would be the smartest thing to do in my opinion if Fitz continues to play well this year. That way we can build our talent in the trenches so our long term QB doesn’t get Trent Edwards syndrome. CB: I think this is a very prudent and realistic approach after this season is over. Fitz is the perfect guy to have especially if you don’t believe a highly touted draft pick is ready to be thrown into the fire right away. Having them sink or swim right away or having them watch and learn for a year has worked in the NFL (example for each would be Elway, Rodgers). Often the mental toughness and character makeup of a player will let a coach know if a rookie QB can handle or persevere through an NFL schedule. So it would ultimately depend on the rookie signal caller they would bring in, but I’m not opposed to that type of arrangement at all, if Chan Gailey believes the young quarterback is better off in the long run. Bills rookie offensive lineman Ed Wang has been lining up at guard in the practice setting for the better part of the last month. But that’s going to change come next week. According to head coach Chan Gailey, Wang will return to the position he played in college and work at offensive tackle again in practice next week. Wang had been playing a bit of catch up having missed most of training camp and all of the preseason, but is up to speed now with the rest of his teammates. Getting on the field this year however, as a rookie, doesn’t appear to be in the cards. Bills fifth-round pick Ed Wang shed the giant club he was wearing in practice the past few weeks to protect his surgically repaired thumb. However, according to head coach Chan Gailey he’s still not ready to use that hand like a normal offensive lineman. “I think we’re a few weeks away from that,” said Gailey. “He’s going to have to keep that protective cast on a little bit longer. It’s not the big club that he had. The good thing about Wang is he should be ready conditioning-wise since he’s been in the practice setting since the start of the season. The home opener is here. I think the Bills have a good chance to get off on the right foot Sunday, but first your questions. Remember AskChris@bills.nfl.net if you’ve got any questions of your own. Do you think that Ed Wang will get any significant playing time this season at LT based on his performance in training camp although it was cut quite short? CB: I think 2010 is going to be a learning year for Wang. I don’t anticipate him stepping in and playing any appreciable time on the offensive line this year. He’s still 2-3 weeks away from having full use of his hand after thumb surgery. Building strength back into the hand will take time after that. There’s a good chance he might not be game ready until almost midway through the season. So with all that time missed I think he’s going to find it difficult to get on the field barring a rash of injuries in his rookie year. 2 – How good do you think the team is compared to last year?? I suppose the Dolphins opener will be revealing. CB: I think these are the areas where this team will be better this season. I think they will be fundamentally sound and execute plays more consistently. I think they will not beat themselves with unforced errors like pre-snap penalties. I think they will be mentally and physically tougher due in part to their rigorous training camp. And I believe they will score significantly more points this season than they did a season ago. All that being said we have to remember that with new offensive, defensive and special teams schemes, they will take time to get rolling. The players will do their level best to play fast right out of the gate, but the speed of regular season play demands that players react, not think and react. Getting accustomed to executing their new schemes at regular season game speed consistently will be the challenge. If they can get to that point sooner than later they’ll be in decent shape. Why don’t the Bills try and make a trade for Charger hold out LT – Marcus McNeil. This would provide a solid LT and Bell could be moved to RT. I have been a die-hard Bills fan since the Joe Ferguson/ Chuck Knox era, and making the trip back into Buffalo for the season opener against the Fins. I believe the Bills are going to pull off the upset. It would be a great start for the Chan Gailey era to knock off the Fins and come out of the gates with a divisional win. CB: I think ultimately that the Chargers and McNeill will get a deal done. They’re not going to get rid of a two-time Pro Bowl left tackle that’s just hitting his prime. Don’t get me wrong, he’d be a great acquisition, I just don’t see the Chargers parting ways with him. Do you go on Twitter at all? Would love to follow your up to date news on the Buffalo Bills. Enjoy your blog a lot. There you can find links to all the latest content at the website, but only occasionally do they re-post my blogs. But you folks can re-tweet my blog posts when you view them. There’s a little tweet button at the bottom of each blog, so you can share them with whoever you want. 5 – Hi Chris, based on the last two preseason games, the Bills offense seems to have improved, but how about the defense? It seems that Indianapolis and Cincinnati were able to move the ball with relative ease on the first string defense. Is there cause for concern? CB: I think we all have to realize that it’s going to take playing in regular season games before a lot of these starters that are new to the 3-4 are going to feel comfortable where they’re just out there playing instead of thinking. This scheme is a dramatic shift from what they’ve played the past four years. It appears to me that players are still thinking and then reacting, instead of just reacting. Reps in regular season games will help to bridge that gap between thought and action, which is why Chan Gailey calls the defensive transition a work in progress.